The apparent victories of the PAN-PRD coalitions in the PRI strongholds of Oaxaca, Puebla, and Sinaloa vindicates the controversial strategy of President Felipe Calderón and PAN party president César Nava of forming state-level alliances with the PRD (and other left parties). 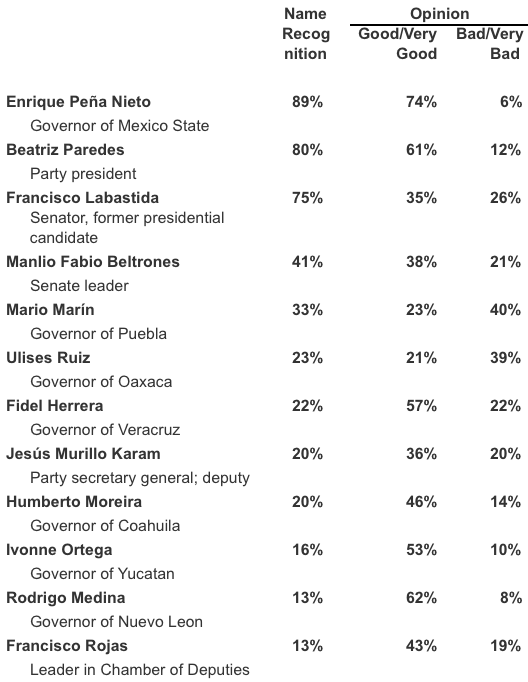 In Oaxaca, coalition candidate Gabino Cué (originally from Convergencia) won 50% to 42% for Eviel Pérez, the protege of outgoing governor Ulises Ruiz. In Puebla, coalition standard bearer Rafael Moreno Valle won 52% to 41% for Javier López, the anointed successor to Mario Marín. Finally, in Sinaloa, coalition candidate Mario López Valdez (“Malova,” who until recently was a priista) beat Jesús Vizcarra of the PRI by 52%-46%. In all three states, this is the first time ever that anyone other than the PRI has ever won the state governorship. The coalition victories also strengthen the hand of PRD party president Jesús Ortega against Andrés Manuel López Obrador, who bitterly opposed the coalitions. Another big winner would appear to be Teachers’ Union head Elba Esther Gordillo. The mobilization of the Union in favor of coalition candidates in Oaxaca, Puebla, and Sinaloa is being given credit for the PAN-PRD victories there. On the other hand, where the Union stood on the sidelines, as in Veracruz, the PRI won handily. Finally, the success of the coalitions greatly increases the likelihood that the PAN and PRD will try to form a coalition for the State of Mexico gubernatorial elections in July 2011 — in what will certainly be viewed as the opening act for the 2012 presidential succession and a test for PRI front runner and current State of Mexico governor Enrique Peña Nieto. Failure of Peña Nieto to deliver the governorship of his own state would be a severe blow to his presidential ambitions and current aura of invincibility.